Byllepest Distro : First Release: ØDELEGGERS - ØDELEGG ALT 12"
First Release: ØDELEGGERS - ØDELEGG ALT 12"
Released in collaboration with Lukket Avd., Ute Av Balanse Plater and Svindel Records. 500 copies. Sorry, no lyric sheet with this pressing. 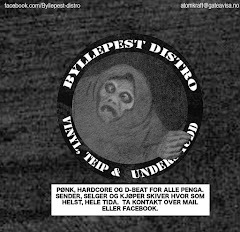 Byllepest Distro & Label No Rights Reserved. Enkel-tema. Drevet av Blogger.